China's Defense Ministry on Tuesday rejected queries by the U.S. military as to why China had used a military aircraft to evacuate sick workers from a new airport on an island China has built in the disputed South China Sea. CNN quoted Pentagon spokesman Captain Jeff Davis as saying it was unclear why China had used a military aircraft rather than a civilian one in the landing on Fiery Cross Reef. China's Defense Ministry said in a statement its military's tradition was to help those in need as part of its commitment to "wholeheartedly serve the people". "In sharp contrast, the U.S. side is expressing doubts about whether it's a military or civilian aircraft at a time when somebody's life is in danger," it said. "We cannot but ask: if a U.S. citizen suddenly took ill on U.S. soil, would the U.S. military look on with folded arms?" 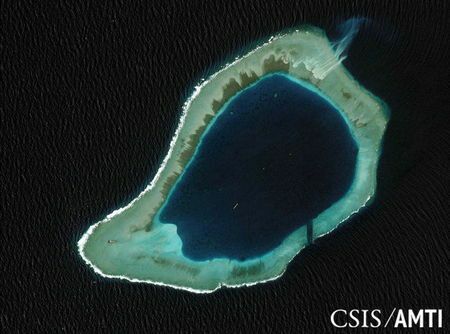 China has indisputable sovereignty over the Spratly Islands and the United States has no right to comment on China's building works and defensive facilities there, the ministry said. Chinese activity in disputed waters of the South China Sea, including the construction of islands by dredging up sand onto reefs and shoals in the Spratly archipelago, has alarmed rival claimants, in particular the Philippines and Vietnam, as well as the United States. The United States has repeatedly criticized the construction of the islands and worries that China plans to use them for military purposes. China says it has no hostile intent. The runway on the Fiery Cross Reef is 3,000 meters (10,000 feet) long and is one of three China has been building for more than a year in the archipelago. Civilian flights began test runs there in January but the landing by the military aircraft, on Sunday, was the first time China has publicly reported a flight by a military plane to Fiery Cross Reef. More than $5 trillion of world trade is shipped through the South China Sea every year. Besides China's territorial claims in the area, Vietnam, Malaysia, Brunei, the Philippines and Taiwan have rival claims. 0 Response to "China rejects U.S. query on military flight to disputed island"